You'll be £6.00 closer to your next £10.00 credit when you purchase The RAF Battle of Britain Fighter Pilots' Kitbag. What's this? The scenes are familiar ones; the young ‘Brylcream Boys’ sat at dispersal waiting for the haunting call of ‘Scramble’, lounging in their shirt sleeves and fur-lined boots, their leather flying helmets lying limp by their side. But what did the RAF fighter pilots of the Battle of Britain really wear, and what vital items would their kitbags have held? The casual air of the dashing pilots of Fighter Command in the Spitfire Summer of 1940 conceals a necessarily professional approach to their task of holding Hitler’s Luftwaffe at bay. Therefore, each item of clothing and equipment they wore and carried had a role and a function, be it for warmth and comfort, communication, or for fighting and survival. 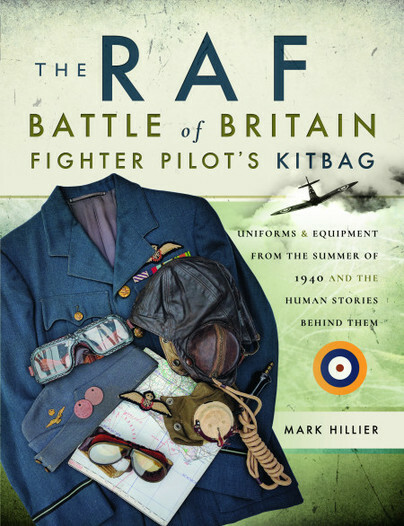 All the objects that an RAF fighter pilot was issued with during the Battle of Britain are explored in this book in high-definition colour photographs, showing everything from the differing uniforms, to headgear, personal weapons, gloves, goggles, parachute packs and the essential Mae West life jacket. Each item is fully described and its purpose and use explained. Relive Britain’s finest hour as never before – through the actually clothing and accoutrements of ‘The Few’. History buffs, militaria collectors and toy soldier and model figure collectors will find a mother lode of insightful information about “The Few” in this book thanks to Hillier’s efforts. one of the standard pictorial books on RAF aircrew equipment / uniforms for this Battle. The book will be of much interest to both aviation historians and modelers alike. This well presented book has been printed on coated paper to ensure the best possible reproduction of the illustrations. An interesting and attractively laid out essay. Very well organised, this book allows us to discover the lives of these airmen, and is addressed to the novice reader as to the amateur seeking to deepen his/her knowledge. Modellers will find interesting information on the shades of the equipment with the colour photographs. This is an interesting and well researched book. Although it may hold limited interested to many wargamers it would be valuable to those who are planning either “Operation Sealion” centred games to include RAF Personnel (e.g Warlord Games downed RAF Pilot) or those wanting to bring an air combat game to life with more detailed models of RAF airfields to wage war above. As well as being an absorbing read, this title is a valuable reference source for historians, re-enactors, modellers and wargamers. Supported by excellent colour photography the author has compiled a first class and well researched guide to the subject. A must for collectors both novice and seasoned. A fascinating book on a subject which is often overlooked. Reading about the actual gear the pilots wore during the Battle of Britain, coupled with many superb illustrations gives the reader a feel of those times. History in print. Mark Hillier is a chartered surveyor who has a deep knowledge of the history of the RAF, with a particular focus on the Second World War. He is also a qualified pilot, having flown for more than twenty-two years. Mark currently flies a Stearman biplane from Goodwood Aerodrome, the former RAF Westhampnett. He has previously written or co-authored five successful books on aviation, including the biography of Wing Commander Thomas Murray DSO, DFC and Bar, contributed numerous magazine articles and is a regular public speaker on aviation matters.